This is a beautiful property and an example of why I’ve fallen in love with parts of Arcadia. Although it was built in the 50s, it’s been completely remodeled and in my opinion look leagues better than any of those mcmansions that have sprung up over the years. It sits up in the hills on the east edge of the Highland community, which I will profile soon. Without any neighbors along the back of the property, it’s probably very private. I like this house and could I afford it, I would probably buy it. Back to the profile part of things, this is a flip. It was purchased a little over half a year ago for $980k and renovated to its current state. The original structure was half a century old and from the pictures, it seems like it was a complete gut. It’s also the first property I’ve profiled that has an underground wine cellar. If that wasn’t original, the flipper spent a lot of money digging dirt. With similar sized homes in the Highland Oaks area renting for $3,000/month, this property is overpriced. Granted, it was completely renovated, but I find it hard to believe it would rent for anymore than a 25% premium (or $3,750/month). A recent sale on 1728 Highland Oaks just up the street sold for $910,000 in February 08. That property had one less bedroom, but was of comparable size in the same community. At $910k, the sale occurred at $379/sq-ft. Admittedly, it would probably be worth a little more than $1,056,652 right now because of the remodeling that was done to the property, but I don’t think it’s $300k+ in renovations. That’s at today’s prices. I would venture to say that a home like this could dip as low as the $900k’s in a few years time. Thanks to our reader 626chump for alerting me to this property. If you end up going to the open house this weekend, don’t forget to come back on AHB to let us all know how it went. Also, I invite anyone else who attends open house(s) to drop a comment or two about how the market is doing. Since I’m not currently in the market to buy, I’m not evil enough to attend open houses just to make low-ball offers. Although, that will change as the market correction continues. Previous PostHuddartNext PostWho Pays for the Housing Bailout? That is a really nice home. Too bad I can’t afford it, either! Sob! Is this the correct prop tax calculation for this home? = 1415 month in property tax alone OUCH! A lot of people don’t think about the property tax, homeowners insurance, maintenance and other reoccurring fees when they buy a home. The few who think about it often rely on their tax refunds to cover the bill. Very few people I know actually put away that portion of funds on a monthly basis to pay for those items. That’s probably also why people pull money from a HELOC to remodel or fix their house. They never planned for a new roof or plumbing until it had to be done – only to find out that they have no savings to do it. It is a well established rule that on average GRM (gross rent multiple) of 160 applies to the rational valuation of residential property. So, if this featured homes rents for $3,750/month, it will not bottom out until 3,750×160=$600k. This may not happens until 2011. I have been an IHB reader since late 2006 and am well aware of IrvineRenter’s use of the GRM. However, I like to use a GRM range instead of a single 160 value. Don’t get me wrong, I’d love for a house like this to fall to $600k, but that may be a stretch. 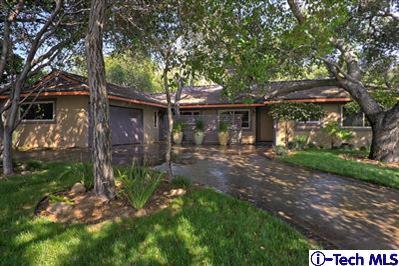 This property is in a highly desirable area of Arcadia and $600k is more than 50% off its current asking price. Can someone find out how much this very nice area home sold for in 1996, or near the last cycle low? And then let’s apply 4% compounded annually to 2011. That will be pretty reasonable estimate how much this property will be three years from now. From what I remember, 4bed/3bath homes of similar size in this area were going for around $500k in the late 90s. Applying +4% compounded annually would put a home at about $740k right now (or $832k in 2011). Since this home was completely remodeled, I would tack on another say $85k premium which bumps it up to $917k. A GRM of 200 sounds about right for the Highlands. If we assume it rents for 3,750 and apply a 200 GRM the house would be valued at $750k right now. As stated in my Data Does Not Lie post, I’m actually expecting a drop of 35-50% over the course of a few years. I’m just not sure if the market would over correct and result in 50%+ price declines in this area. That would be great for buyers on the sideline like me. Good morning, SavedbyGrace. Your estimation appears to be right on the mark according to IHB’s chart. How fast that Pasadena/Arcadia Highland corrects, in my opion, depends on mainly three factors: foreclosure rates, job market and degree of government intervention. However, sooner or later, I believe market always catches up with fundamentals. So, If you can rent at $3000-$3750/month, why pay anything more than $700k while it is still losing value (or equity) 10% or so a year? I’m tempted to go to the open house today and check it out in person. I drove by yesterday and the outside looks better in the picture than it does in person. That being said, it was a beautiful, serene neighborhood with many great homes. Look for a community profile about the Highlands soon. I went by the open house today, close to the end. There was a good amount of foot traffic for the fact that the open house was going to be over in 10 mins. There were about 3 other couples there at the time. A few of the people there seemed highly interested. I overheard a couple of people inquiring about when to make offers and the timeline for everything. I even heard one lady talking to her husband about what she could do with the landscaping and such. The rooms were a lot bigger than I had imagined, mainly because the fisheye camera lens threw things out of proportion. The place was actually pretty cool in temperature, given the fact there is no central A/C and it was 100deg outside. All the trees around the place help block out the sun and keep the heat off of the house. I personally wouldn’t pay over $900k for the place because it was bought way too high last year. There’s also some old features of the house that still stand out. The air vents, the attic access and the garage still really show how old the place is. Overall, the place was very nice. I don’t expect it to be on the market long because I am sure some knife-catcher will fork out the money to live here. Unless the buyer can put a large downpayment, it will be more and more difficult to finance a home at this price. Even if it’s a move-up buyer with lots of equity, it’s still contingent on selling their current house in order to use that equity as downpayment. It will be interesting to see what this house sells for in today’s market. They probably won’t get the asking price, but I agree that some knife-catcher will pick it up. Just thinking about it, a person would have to take out a massive jumbo loan to pay for this place. Even with the conforming limit raised to ~$700k for this area, the difference will definitely push the loan into the jumbo category, because I doubt anyone will have ~$600k in equity. I just can’t imagine anyone coming up with the kind of money necessary to buy this place. Please update us with the loan information if/when this place sells.